Dental Implants Fresno, CA - Fresno Dentist Curt P. Posey, DDS, Inc. Dental implants are synthetic structures that are placed in the area of the tooth normally occupied by the root. Dental implants are anchored to the jawbone or metal framework on the bone and act as a foundation for an artificial tooth or permanent bridge. In some cases, implants can be used to attach dentures. Not everyone is a candidate for a dental implant, however. For a successful dental implant to take hold, a candidate must have proper bone density and have a strong immune system. In all cases, dental implants require strict oral hygiene. Surgery is necessary to prepare the area for a dental implant and place the implant in the mouth. Following the procedure, a period of time is required for the implant to take hold and for bone tissue to build up and anchor the device. 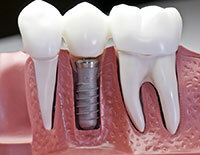 In some cases, metal posts are inserted into the implant during a follow-up procedure to connect the tooth. To find out if you are a good candidate for dental implants call Curt P. Posey, DDS, Inc. in Fresno, CA at (559) 227-6755!